Let me start out by saying that I AM NOT a naturally organised person. Although I like a certain amount of order in my professional work and surroundings, I’m what you might call a stereotypical “right brain” creative thinker. Lists are my friend but spreadsheets are merely a means to an end, a necessary evil that I take no pleasure in. In fact, I’m always ever so slightly suspicious of people who get excited about what I believe to be simply, admin (this probably comes from a place of unorganised envy). So even though I’m the kind of person who can miss a flight back from South America by two weeks, get lost on a walk in the local woods and misplace sunglasses for an hour (they were on my head) – I am still more organised than Jackson. This meant I took the brunt of organiser duty. 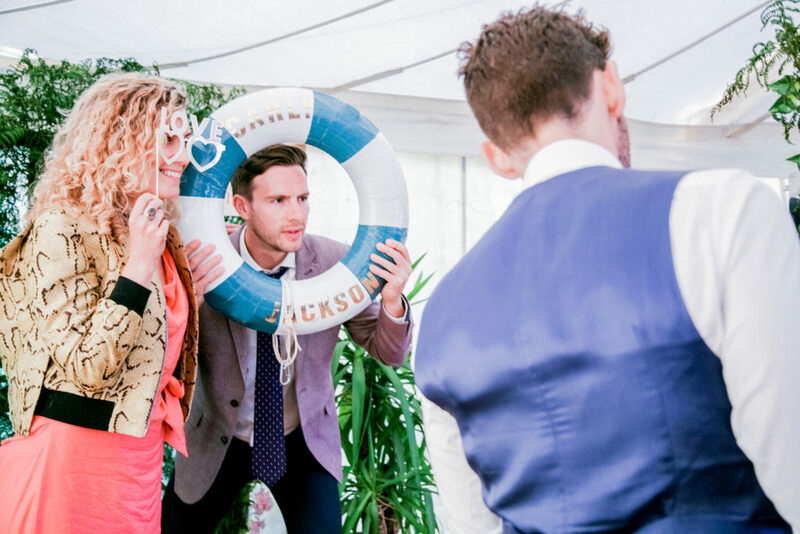 I wrote this blog just in case they might be of use to someone out there planning their own wedding, who doesn’t find glossy wedding magazines remotely helpful. When we got engaged, there were a lot of conversations about what kind of wedding we wanted to have. I liked the idea of going abroad somewhere with just a few close friends and family. Imagining late night cocktails, laughing into the warm air of the night and lounging around a pool, we started Googling our options. After exploring this idea a bit more, we both realised it wasn’t going to work, Although we’d probably get great weather and a chilled weekend away with friends and family, there was a big downside. Not everyone we wanted to be there could join us if we went abroad. My grandma on my Dad’s side, for one. We wrote down our priorities for the day. Certain things like “music” and “friends and family” were higher up than others. Doing this really helped us to justify how we spent our budget. 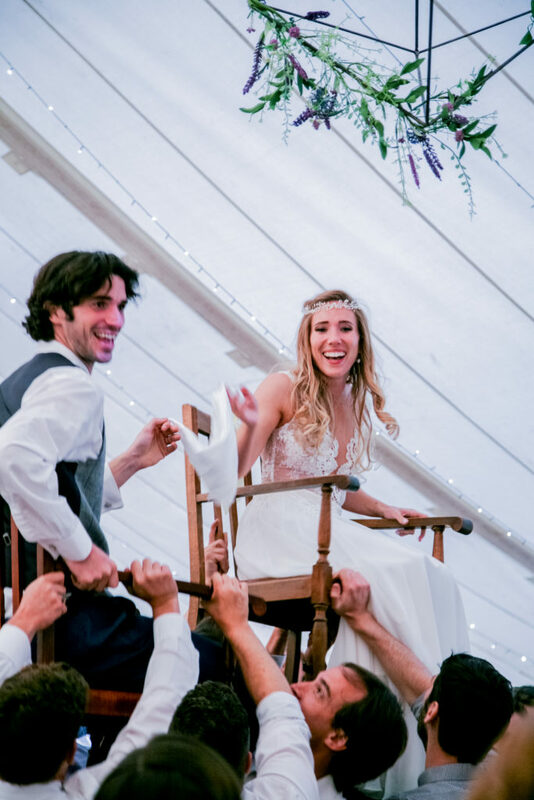 Your family, friends, the butcher, baker and candlestick maker will ALL have ideas on what you should do to celebrate your wedding. We stayed firm about the things that really matter to us, but with everything else, we felt happy to concede and let the people we cared about have a say. After all, neither of us would have been happy if our parents or siblings had felt really pushed out by our plans. We tried to think of ways to inject some of our personalities as a couple into the day to make it our own. 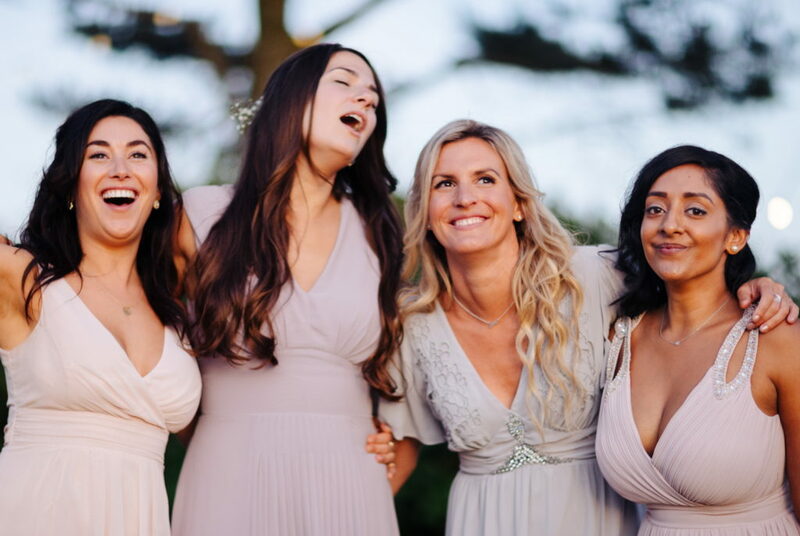 Paying attention to the simple things, we spent hours choosing songs by our favourite artists for the playlists to switching up traditions like serving our favourite cocktails and spirits instead of champagne at the reception. We used as many natural colours and materials as possible and handmade as many things as we could! Although we thought we could plan most of our own wedding, something I was adamant about was having a coordinator on the day. After all our hard work it was important that we could both relax as much as possible and just have fun when the day arrived. 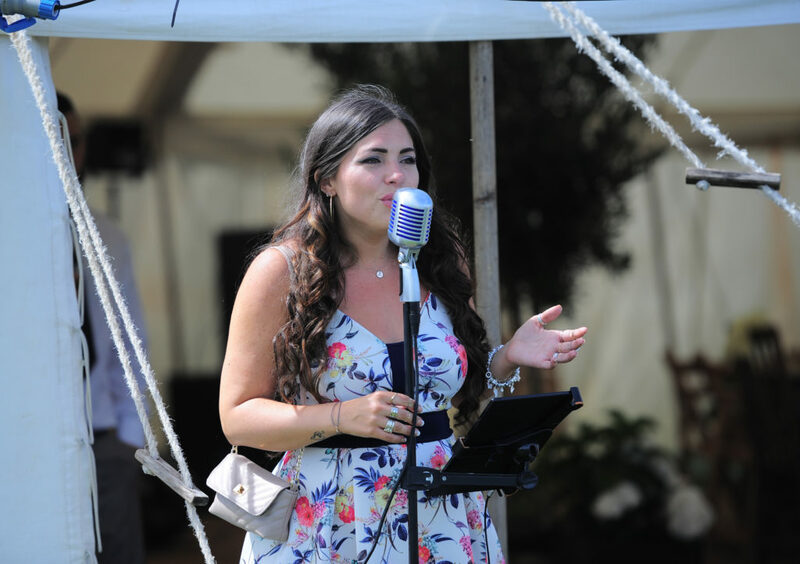 First I contacted the lovely Jen at Jenny Wren Weddings & Events. I used to work with Jen and knew she offered a brilliant wedding planning and coordination service. 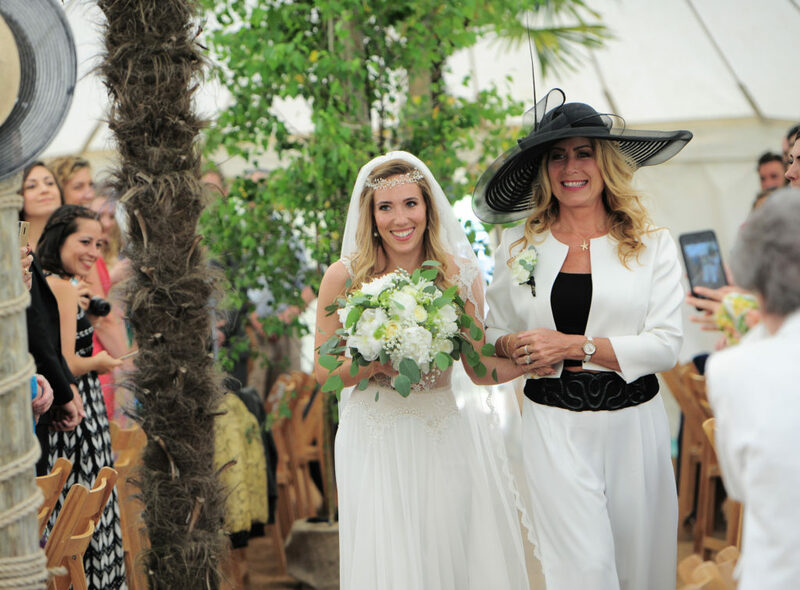 Unfortunately she and her team were busy on the day of our wedding, but still managed to give me some really helpful advice and tips – even though she knew we wouldn’t get to work together! 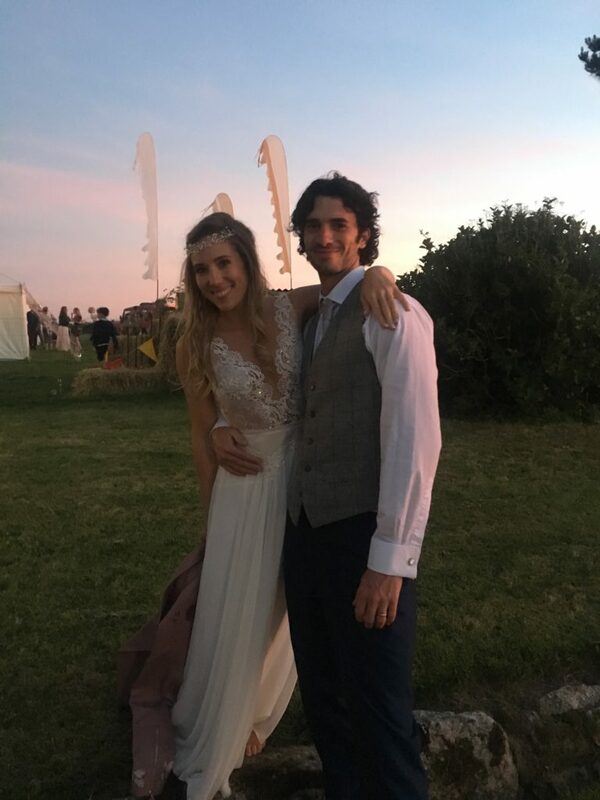 After searching online, I luckily found Hayley at the Little Cornish Wedding Company. Hayley was lovely and I immediately decided I wanted her to coordinate our wedding. Although the brief was to make sure everything went smoothly on the day, she provided so much valuable information and advice in our lead-up meetings and by email that I’m certain that having Hayley was the best money we spent. 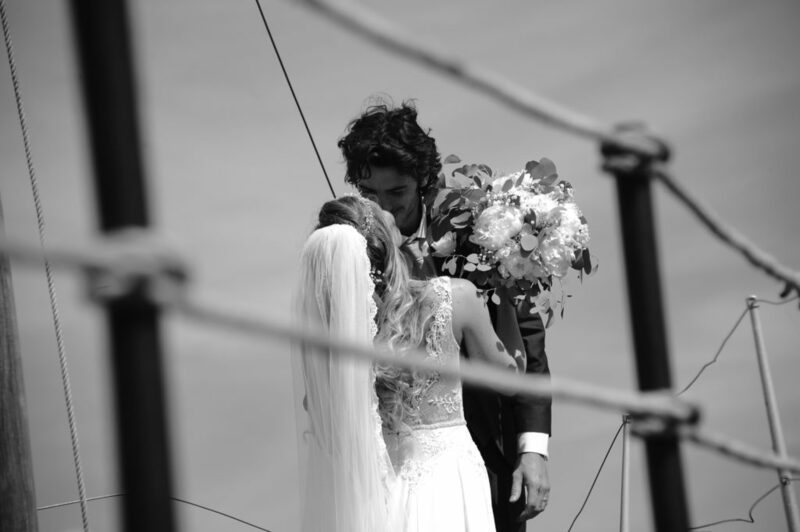 Ultimately it meant that we felt like guests at our own wedding and didn’t have to worry about anything. The whole day went smoothly and we didn’t need to know what time it was or be aware of any schedule. 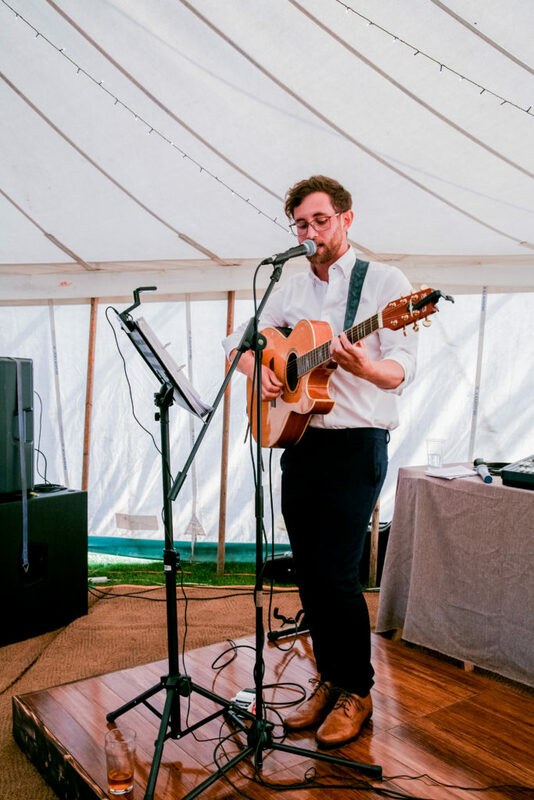 Also, all our suppliers, caterers, musicians and anyone else had a point of contact that wasn’t Jackson or me, so didn’t have to worry about getting in the way. In the days leading up to the event we also got some brilliant help from friends and family who helped up put up and hang the marquee lighting and decor, run around getting fuel for the generator, create a photo booth from plants, collect and set up the sound system, feeding us and generally keeping us sane! Because we’d done so much planning for the day we wanted to keep parts of it a surprise. We asked people not to tell us what their readings were for the ceremony and let others choose things like our cake, my bouquet, the bridesmaid flowers and some other elements of the day. We were incredibly lucky that Jackson’s parents have a field next to their house big enough to pitch a marquee. 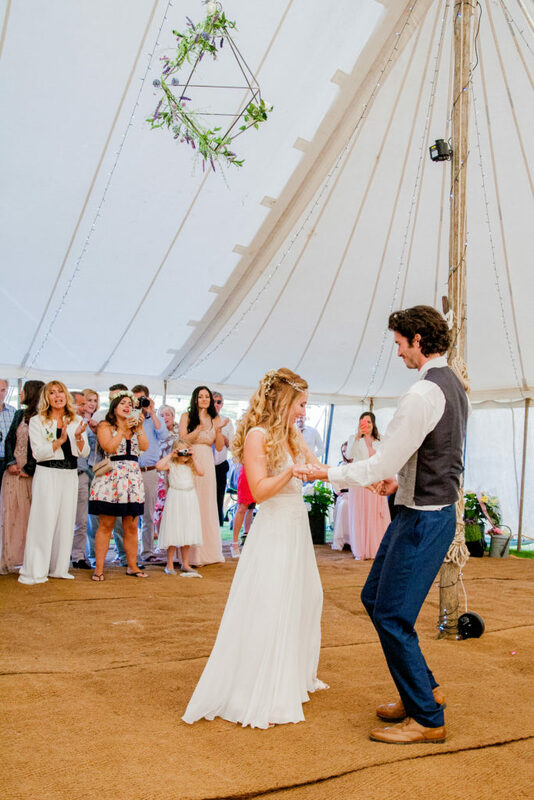 Renting a space for a marquee can be really expensive so this helped us stick within a reasonable budget. 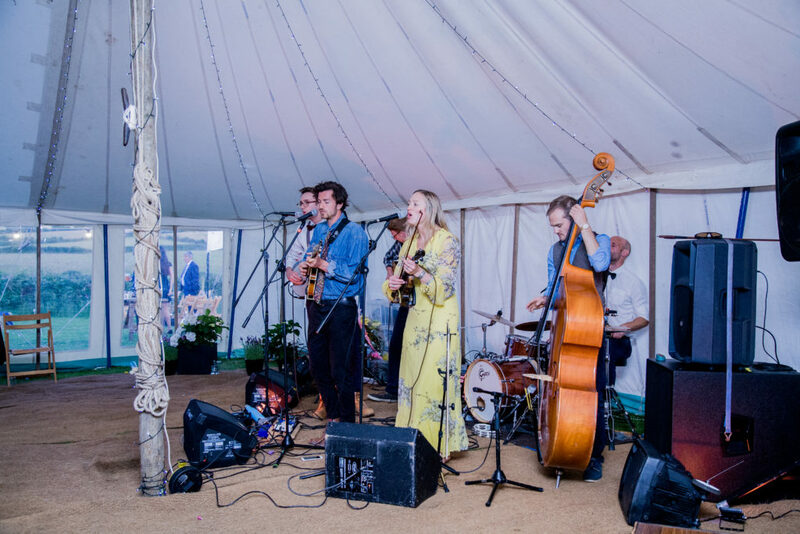 Having a marquee meant that we had more flexibility into what suppliers and caterers we used, what alcohol was served and how long the party went on for. As we didn’t know what the weather would be doing (does anyone, ever? ), we wanted a marquee that could be closed to the elements if needed. 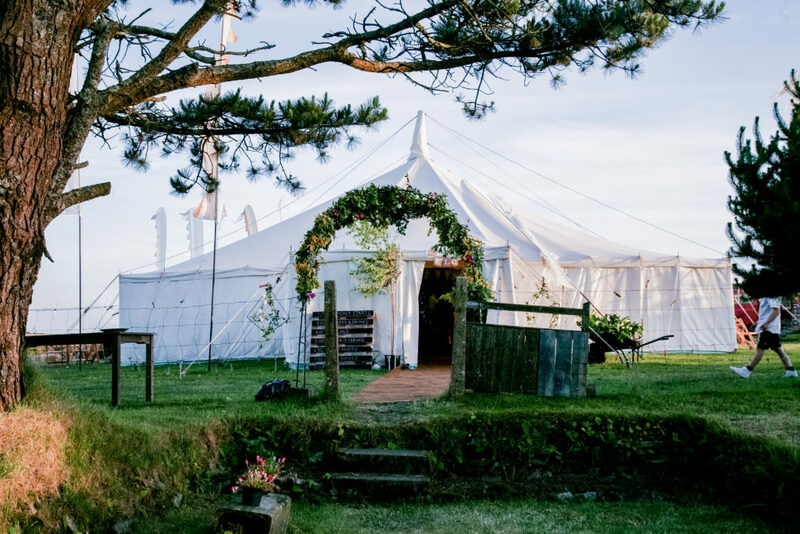 It can get really blustery at the site, so we opted for a traditional tall canvas marquee with wooden central supports that wouldn’t rattle in the wind. 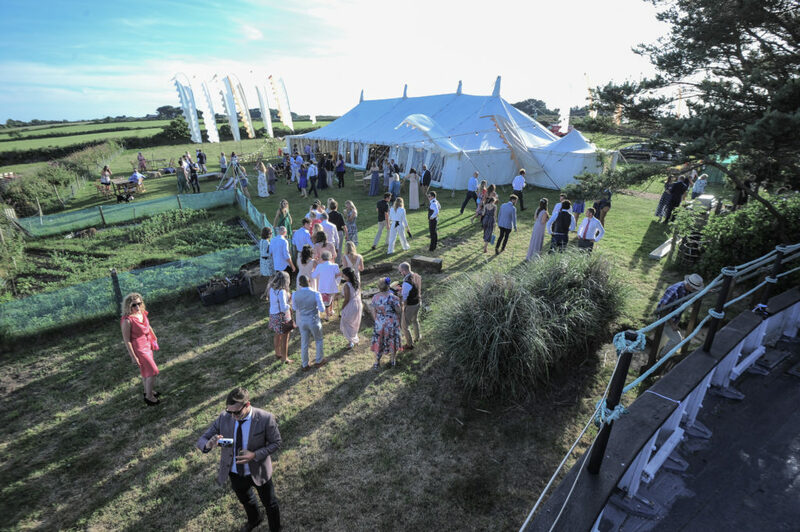 The company we used are called Western Event Hire, although there are several excellent companies that provide this style of marquee in Cornwall. 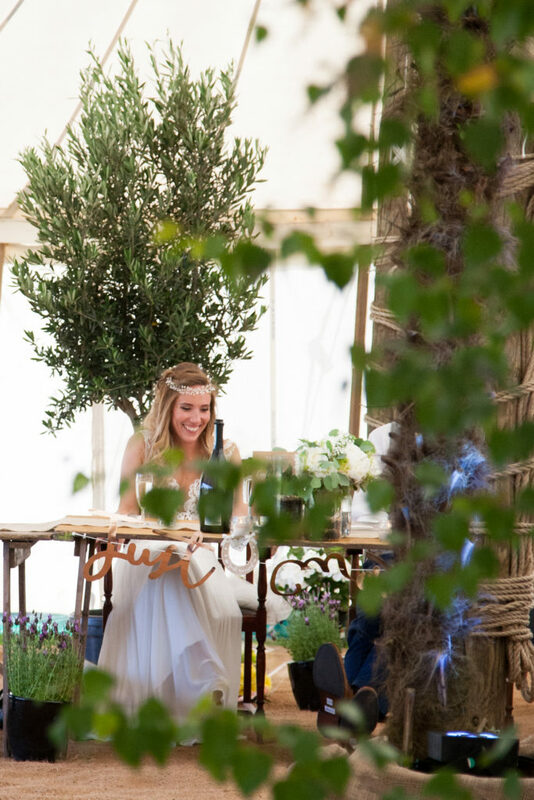 All our rustic chairs, tables and fairy lights we hired from the same company. Occasionally, marquee companies will be willing to offer a discount if you pay in cash, upfront. Just make sure that they are a trusted company and that you get a receipt. It’s also worth haggling for a better price if you’re hiring several products from the same company. 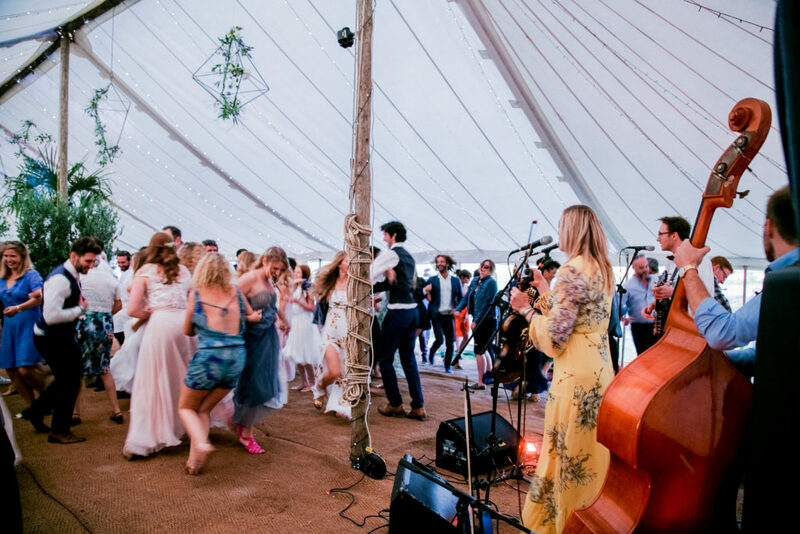 Traditional canvas marquees are beautiful without a lining, giving the set-up a more rustic effect. Coco-coir matting is a great, cheaper option than a wooden floor and still forms a stable base for your guests to walk and dance on. 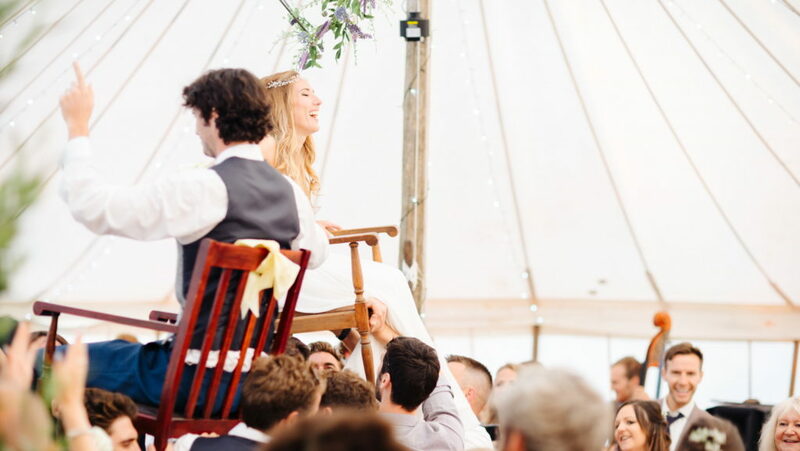 Often, the marquee company will offer chair and table hire, glass hire, generator and heater hire and more. 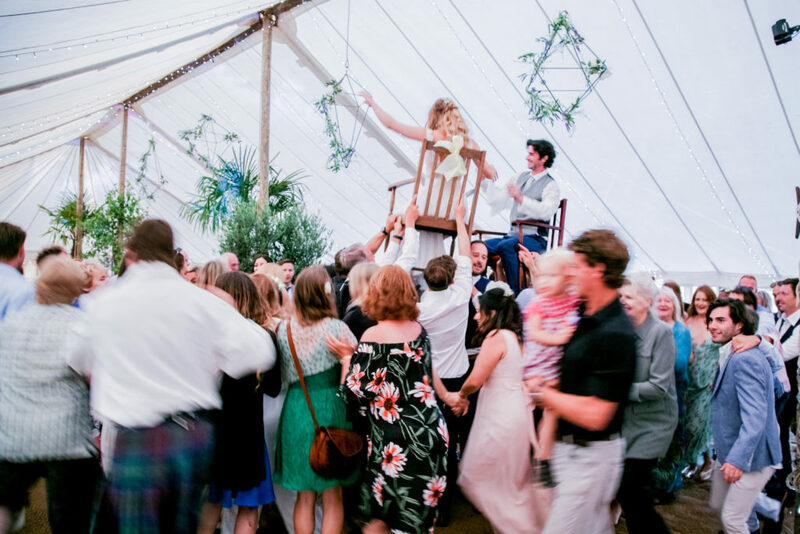 Whilst it’s worth hiring chairs and tables from your marquee company, you will probably be able to get glasses, generators, lighting and heaters much cheaper elsewhere. You can hire glasses for free at major supermarkets like Tesco, Morrisons and Waitrose. You don’t need to buy anything from the supermarket to take advantage of free glass hire. Write down the amount and type of glasses you need and call the big supermarkets in your area to find out about availability. We hired our glasses from Morrisons as they offered a 3-day glass hire from Friday to Monday, meaning we had time to wash the glasses in a dishwasher the day before (important as although they were supposed to come clean, not all of them did). Many bar hire services will only charge you a very low amount, if anything, to provide a bar at your venue. Most of their profit will be made from selling drinks, so it’s worth shopping around. Make sure whichever bar you hire is licensed for selling alcohol on the premises. Gourmet traditional three-course meals didn’t fit the vibe of the day, but we still wanted the food to taste amazing. It took a long time and a great many emails and phone calls to find someone we were 100% happy with. In the end, we chose Craftworks Street Kitchen and their gourmet street food menu. 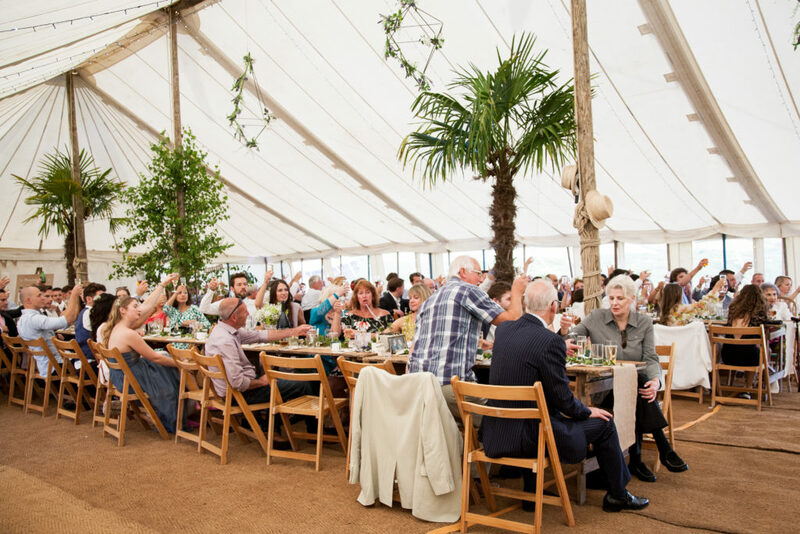 We had so many comments about the food on the day, they did an incredible job feeding everyone to the point that hardly anyone had room for dessert! To keep the vibe casual without cutting on quality, we opted for a recommendation for Wild Bake. 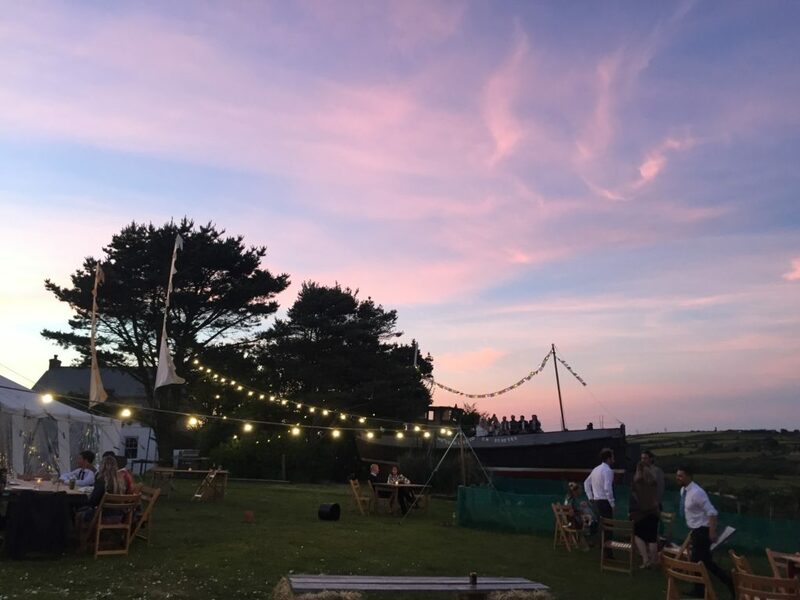 So many people we knew had eaten and loved Lewis’s pizzas that we knew this would be the perfect evening food for our guests. Delivered into the venue, the amazing, fresh wood-fired pizzas were cut into slices were presented on slate boards for guests to choose from. Lewis only stopped making the pizzas when people couldn’t eat another slice – and even left a few more behind just in case anyone needed a midnight snack! We also bought sweet jars and filled them with huge tubs of our favourite sweets which were really popular later in the evening. 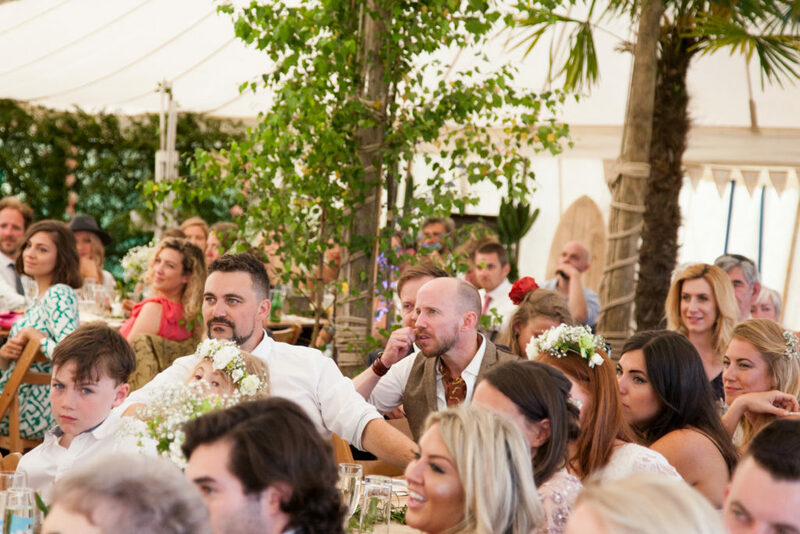 Our evening food caterer, Wild Bake, offered a service whereby the invoice could be issued after the wedding, therefore spreading costs out which can be useful on the lead up to the big day. You also have the option of capping the spend at a certain point, ensuring you didn’t go over budget but still making sure you were providing a good amount of food to keep people going over the evening. Many caterers or food truck services do this so it’s always worth asking. It’s so hard to find the right invites. You worry how much information you need to add, when you should send them out and how as well as what kind of style will best reflect the day. Luckily, I’d met the amazing Kristal Fanning at Paper Birch after sharing an adjacent desk at Stranger Collective and bonding over a love of hip-hop dancing (true story). She offered to create the perfect invites as well as helping us find the right envelopes and our own gold wax seal. After deciding to hire a traditional canvas marquee with coir matting, we decided to try and opt for something simple, natural and elegant. To incorporate as much greenery as possible, we moved our indoor yucca and palm trees into the tent. After 20 eucalyptus trees that we bought had failed to flourish thanks to the double frost this year, instead we hired four tall birch trees, two olive trees to get married next to and some huge palms from the local garden centre, Trevena Cross. 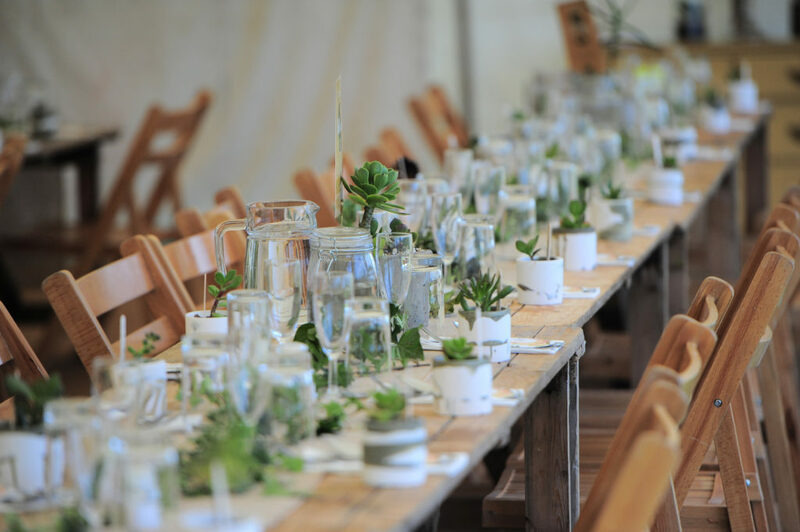 We cast concrete pots to use as centrepieces, planted with succulents and cacti, keeping them low so everyone at the tables could see and talk to each other. I’d had an idea about hanging some big geometric shapes from the top of the marquee like chandeliers. After debating about how we could make these, we asked a friend to create the shapes by welding thin tubes of metal together. We found a secure way of suspending them inside and outside the marquee so they wouldn’t fall and kill anyone… something I’d been a bit paranoid about. Jackson made resin planters to give as favours that would also act as the table decoration. We bought cacti and grew our own succulents from cuttings to plant inside them. As table numbers, Krystal at Paper Birch created A5 cards, each named after one of our favourite beaches around Cornwall, complete with a story of why the beach on that card was significant for us as a couple. 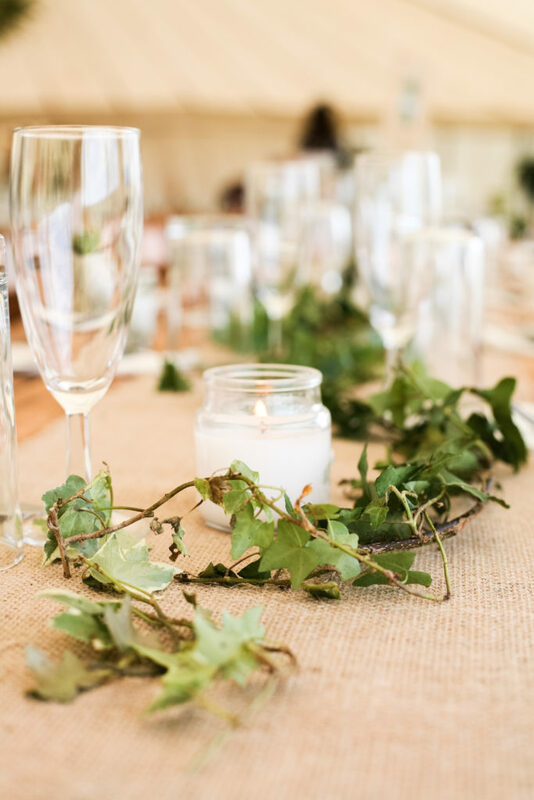 Buying flowers as decor for your wedding can be extremely expensive. Instead, you can hire flowers and plants from some garden centres for a percentage of the cost they are to buy (usually around 20%). This often works out much cheaper than flowers and means you can still make a big impression with foliage and plants. As a gift, my sister and her partner bought us one of the olive trees that we were married next to. I loved this idea and hopefully, we’ll be able to keep it for the rest of our lives (if we can keep it alive!). Spending a lot of time posing for formal photos isn’t something either of us enjoys. Photographers can be extremely expensive and although some really are amazing, after friends had told us about their own bad experiences, we were put off by the idea of hiring someone. Luckily our very talented friends Rob Young, Anna Estop-Hall and Toby Weller who works as a professional photographer offered to take some photos. 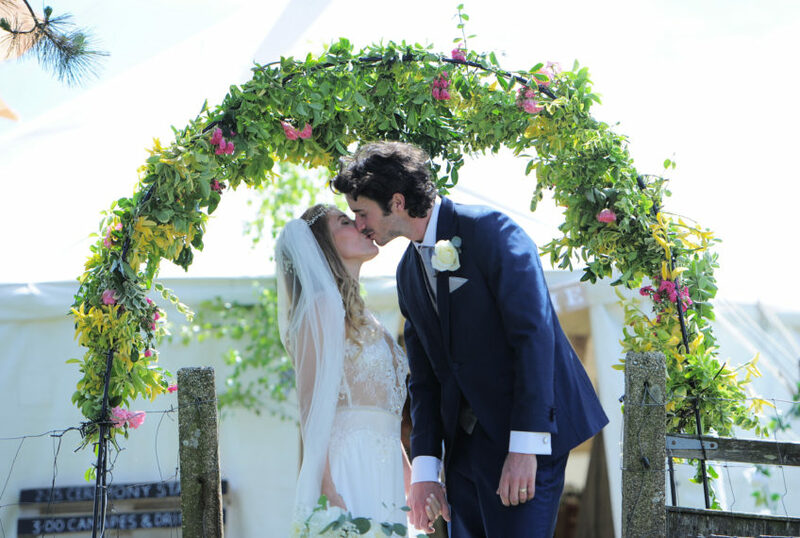 They all did an incredible job of capturing the ceremony and the day. Toby, Anna and Rob know a lot of the guests, so everyone was relaxed having them around and happy to have their photo taken without feeling too self-conscious! For fun, disposable cameras were put on all of the tables during the meal for the guests to take snaps. Although they’re definitely not the best quality and it did look like we had our wedding in 1985, we’ve got some absolute crackers as a result. 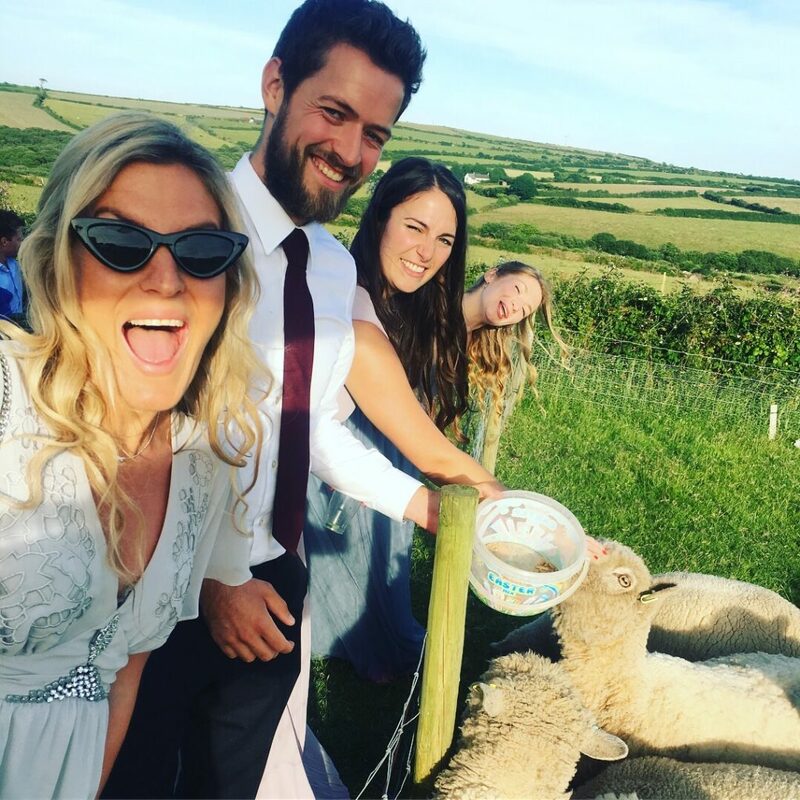 It was a great way to see what everyone got up to during the day because you can miss so much at your own wedding! 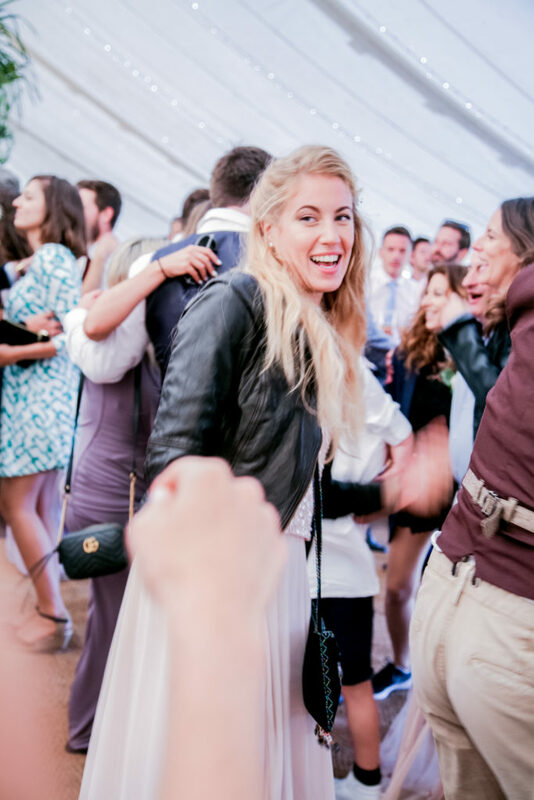 Anna managed to capture loads of candid shots of guests enjoying themselves! We called in some help from friends, Georgia Darcy Roden and Richard Morris, both part-time professional singers, who kindly agreed to lend us their incredible voices for parts of our day – thanks, guys! Spotify was used for creating playlists for different sections of the day when people were arriving or eating, with loads of our favourite chilled tunes. We finally found a local band, All Good Things, made up of incredibly talented musicians and singers. Jackson had repaired a few of the band members surfboards the summer before and luckily they had the date free. They even – incredibly – managed to learn the Jewish wedding song Hava Nagila in just a couple of days – giving the “best and longest performance of Hava Nagila I’ve ever heard” according to my Grandma, who’s heard it MANY times during her almost 90 years (an accolade indeed)! Local band, All Good Things managed to get everyone on the dance floor! Jackson’s good friend Richard Morris kindly warming everyone up before the band. My wonderfully talented friend Holly at Holly Young Millinery created the hairpiece I wore on the day using hundreds of tiny organic pearls made arrange to look like gypsophila flowers. The pearls matched the earings Jackson had given me that I was wearing on the day, as well as the pearls inlaid in the dress. The dress I wore was from Alon Livne White and was custom made and fitted in their flagship store in Tel Aviv, Israel. I definitely wouldn’t have had the chance to wear something so beautiful had I not entered a competition on Instagram (something I never usually do but was convinced to do by Jackson’s sister, Raphaella). After looking like a complete weirdo prancing around and lip-synching to “Still Haven’t Found What I’m Looking For” by U2, they somehow came to the conclusion that I deserved to choose from over 10 gowns out of their latest collection. The gown I eventually chose was coincidentally called “Melanie”, my mum’s name! It was obviously meant to be! As I didn’t buy the dress myself, we thought that it would be the right thing to donate any money that came from the sale of the dress to a mental health charity, in honour of my dad. If anyone knows of a great professional wedding gown dry cleaning service, please let me know! Toby was so discreet I didn’t even remember him taking photos as we walked up the aisle! On the day, my 12 bridesmaids + mothers of the bride and groom descended on The Priory hair salon in Falmouth. Despite there being so many of us, they managed to wash, blow dry and style everyone’s hair in just a few hours. An extraordinary feat! They let us make countless crumbs munching croissants and pastries from Stones Bakery whilst they got us ready and all joined in the excitement whilst keeping everyone organised! I could go on and on about the day as there’s so much to say and a year of organising behind us but ultimately, no one wants to copy exactly what we did. The best advice I could give anyone is, put your own personality into your day. If you don’t have time for the bigger things, think about the small things like the playlists, the colours and the table names. You don’t have to do your own DIY wedding to create something that’s unique to you. Also, remember that as long as you both enjoy the day – everyone else will too.